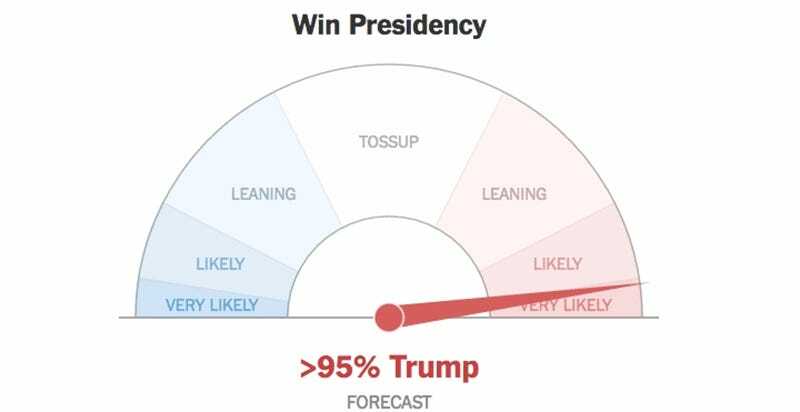 The New York Times is currently tracking the state of tonight’s hellish presidential election with what appears to be a ... pressure gauge? Speedometer? SocialFlow resonance meter? ... illustrating the leading candidate’s chances at winning the Electoral College and thus the presidency. As you can see above, as of this writing, the paper’s little gizmo is indicating that Donald J. Trump has a “>95%” chance of occupying the White House.